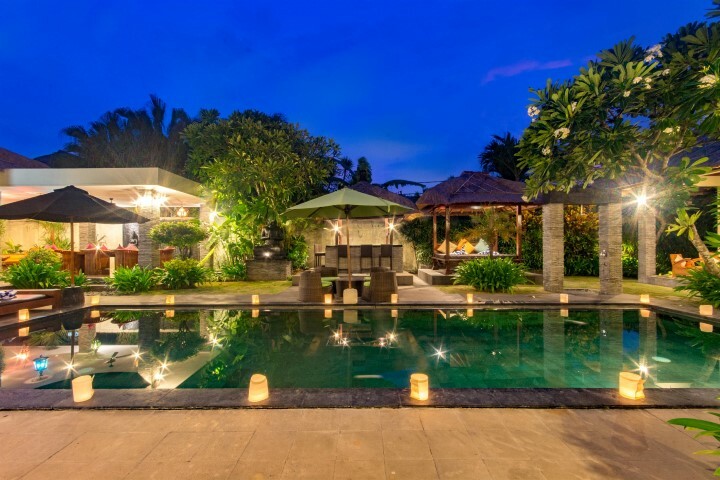 Villa Mahkota is an exceptional place to stay. Kadek and his trusty team are extremely helpful and accommodating and I found the facilities to be up to date and all in perfect working order. After staying in Bali several times in different locations, I will never stay anywhere else now! Absolutely loved it! Thank you! 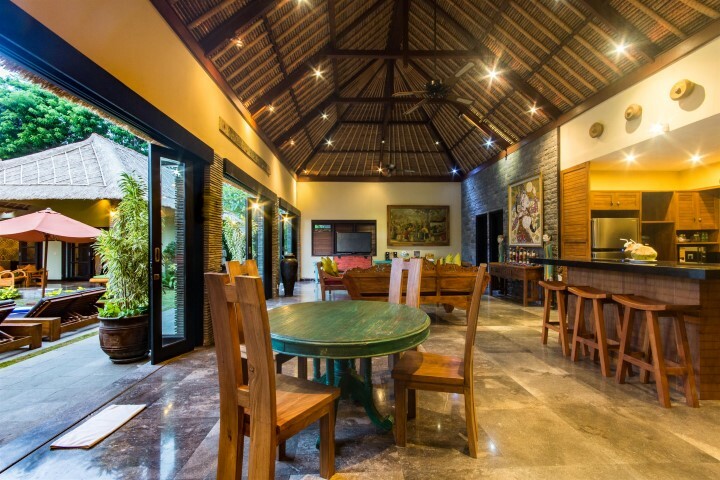 Comfort and style are the prime features of Villa Mahkota, which has a beautifully decorated and light-filled interior. This single-storey villa comprises four bedrooms as well as a children’s room. 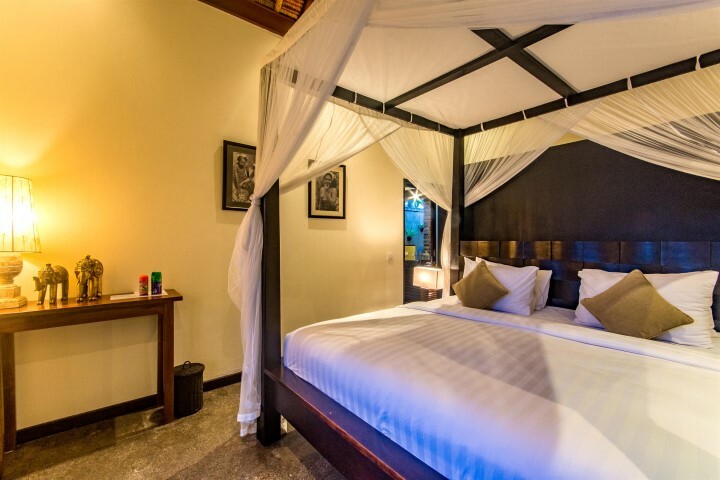 Each of the four spacious bedrooms has semi-outdoor ensuite bathrooms and a terrace overlooking the pool. 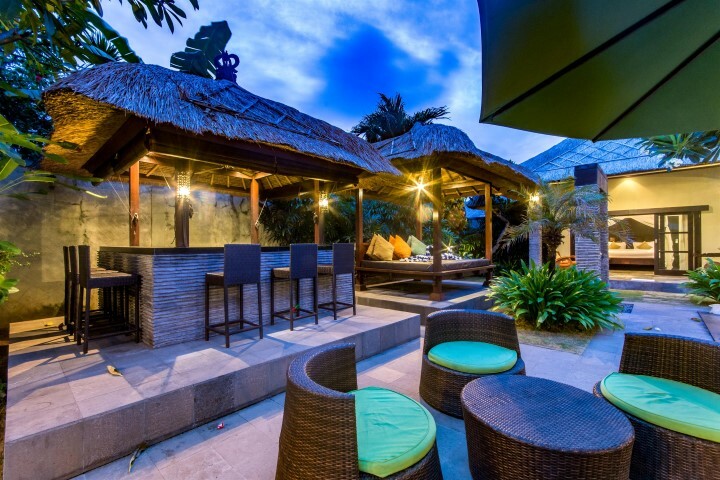 When it comes to outdoor entertaining, Villa Mahkota has it all with a sun-shade under which 10 people can dine, an outdoor bar/BBQ and comfortable lounge chairs. 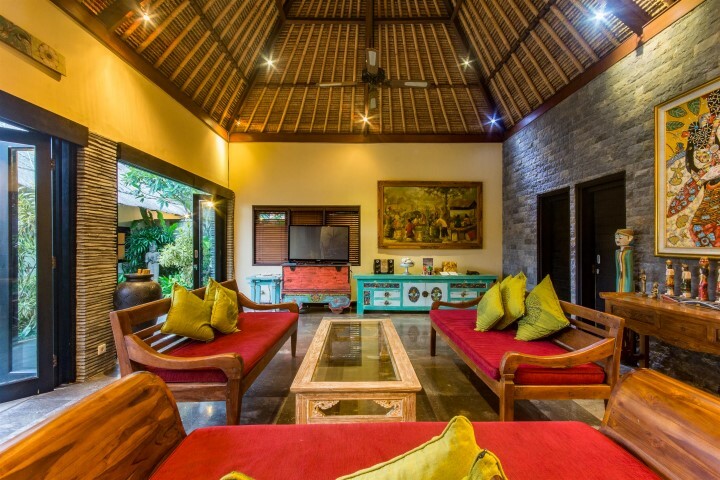 The property has all the ambience of a traditional Balinese compound with spacious accommodation around a luscious tropical garden – there is everything you need for a family getaway or a great holiday with friends. 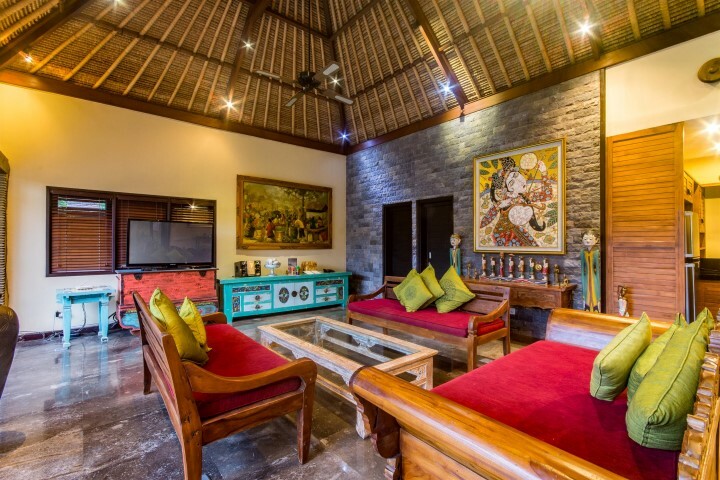 The main pavilion houses a relaxing living area with a comfortable sofa, great for watching television. The room has sliding doors, so it can be enclosed. 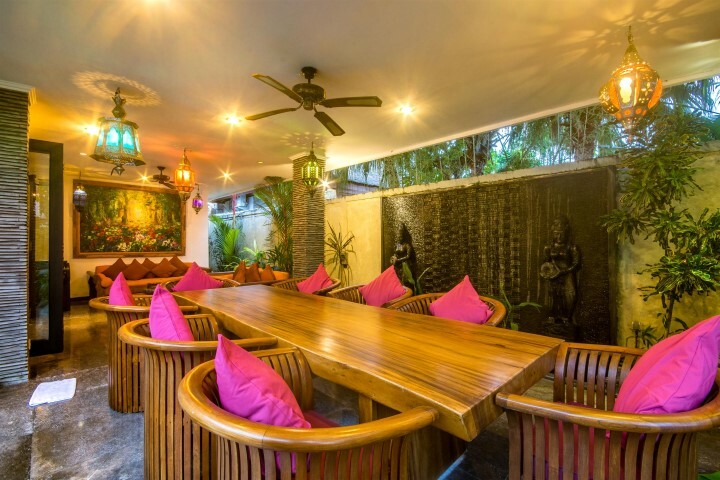 The dining area has elegant tables and chairs and overlooks the gardens and a water feature. 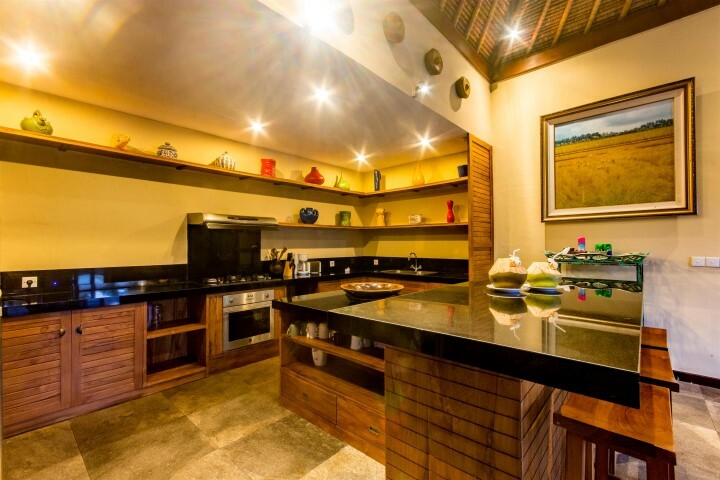 In the corner, the kitchen has a gas stove, a microwave, a coffee maker, a juicer, a water dispenser and a refrigerator and is well stocked with cutlery, china and glassware. 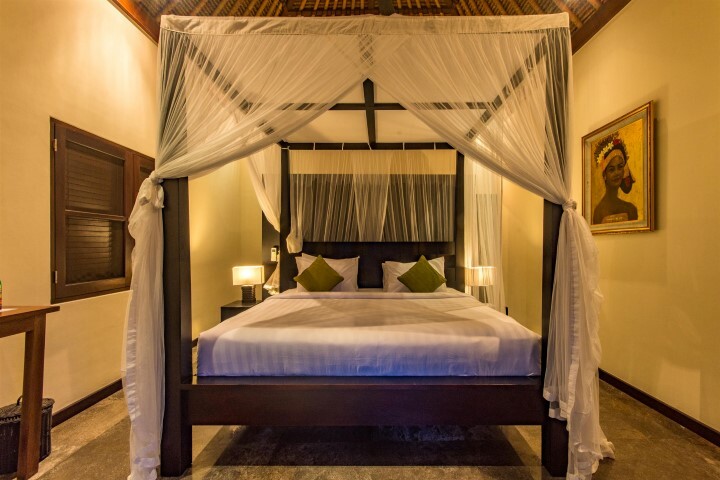 Across the swimming pool, stone steps lead up to the master guest house which has two air-conditioned bedrooms with king-sized beds on either side of a children’s room. 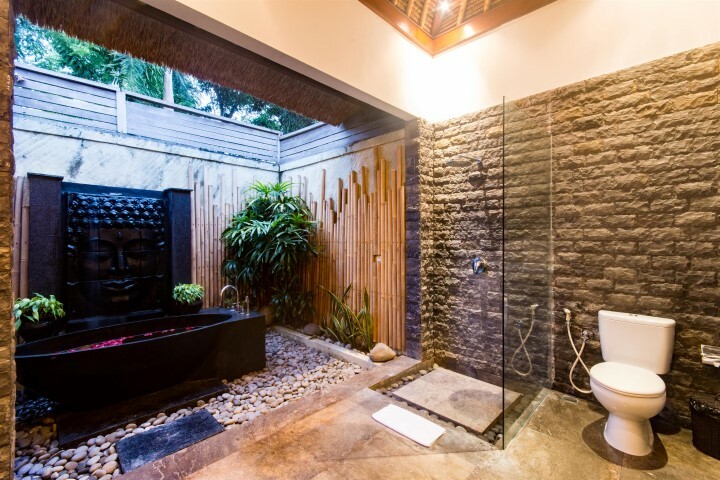 the shared bathroom has a bathtub and shower. 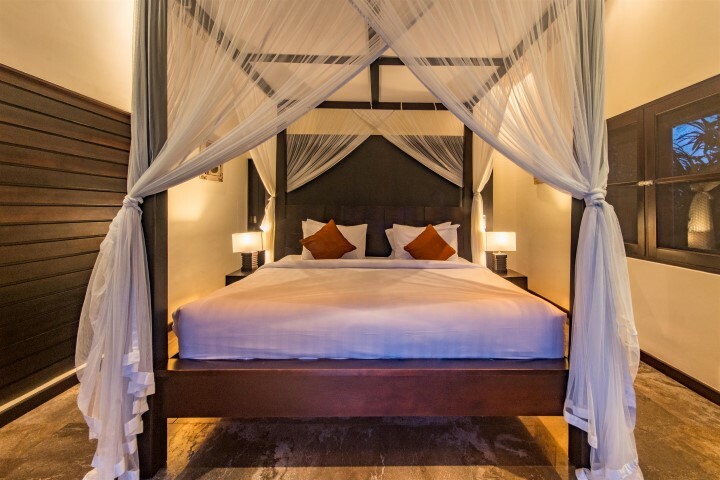 The guest house has two double bedrooms, with king sized beds, where guests can enjoy relaxing views of the swimming pool, gazebo, barbeque and bar and the tropical garden. 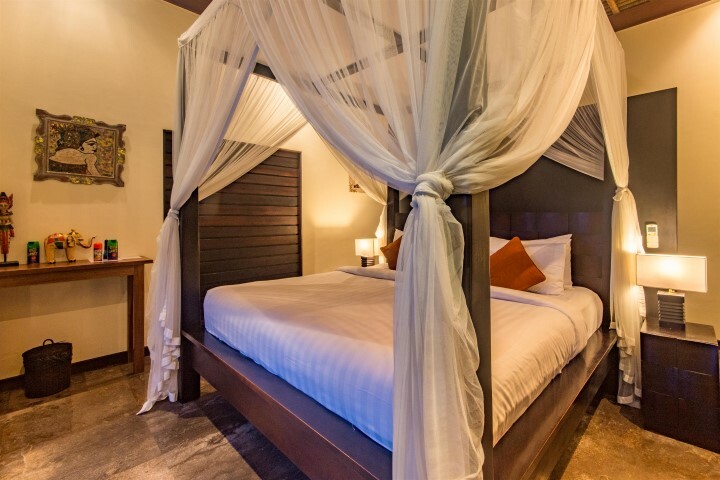 Each of these air-conditioned rooms has a safety deposit box in the wardrobe, a bed-side lamp and a mosquito net. 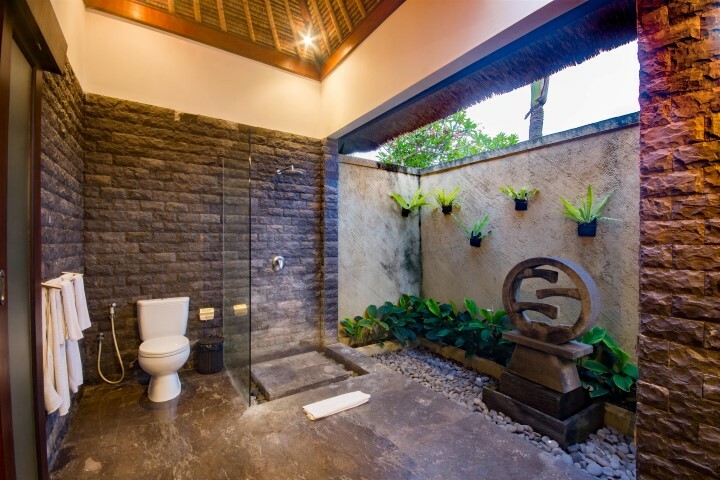 The bathrooms have open showers with exclusive guest shampoo and soap. 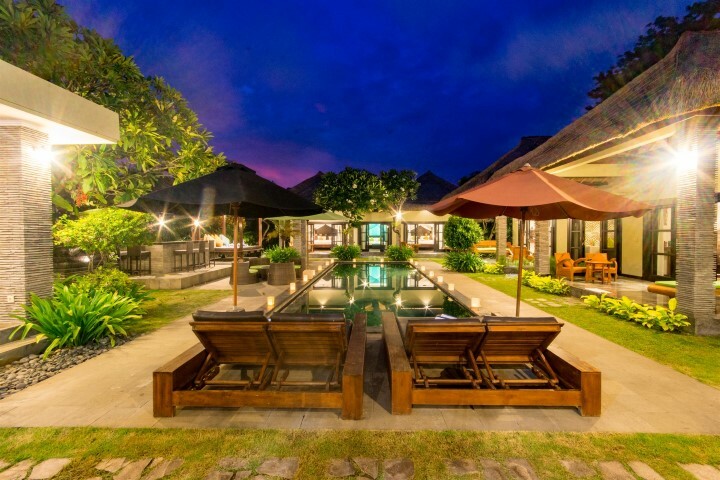 Villa Mahkota is punctuated by an azure infinity pool which is surrounded by lush gardens, beautiful grassy lawn, palms and many tropical plant varieties. 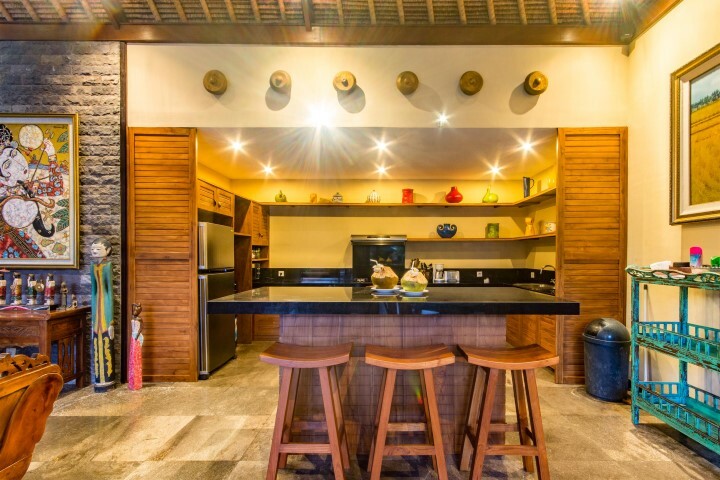 Between the master guest house and the main building you’ll find the barbeque kitchen and bar where you can entertain friends at the end of another perfect Bali day. 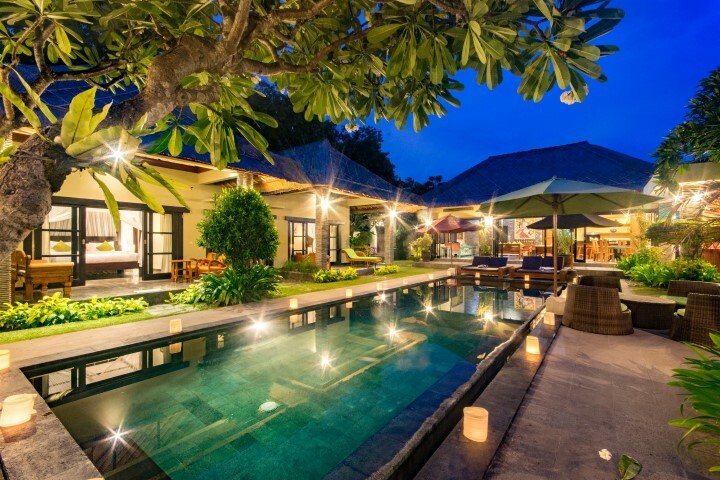 We could not fault Villa Mahkota! It was even more beautiful than the photos! It was a perfect place for two families of 4 with room to spare. The pool was devine and the rooms and bathrooms were beautiful. Incredibly comfortable beds and pillows too! The staff were incredibly helpful arranging massages, washing services, food deliveries and an in house banquet all at short notice. Our daily breakfast was delicious and we were so lucky to have Arta assigned to cook and care for us for our entire stay. 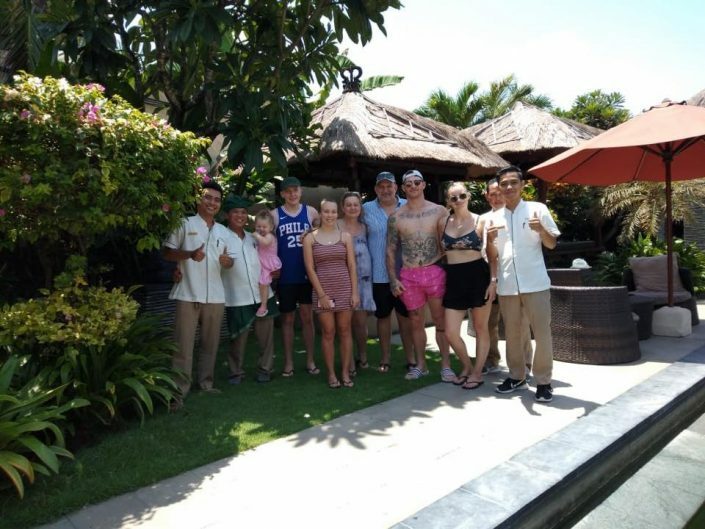 We highly recommend Villa Mahkota for its privacy and peace and it’s close proximity to being in the middle of all of Seminyaks action. Can’t wait to come back!! Special thanks also to Rai and Arianta for their help during our stay. Elissa Rick Indi and Kai Stillman. Stacey Fred Brooke and Mia Erickson. 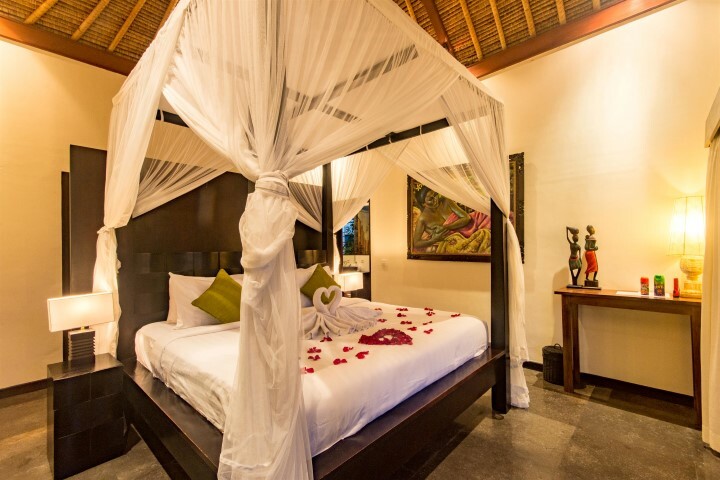 This is a 4-bedroom villa and the facilities are exceptional. Our Chef arrived each morning to prepare our selected breakfasts and the staff cleaned all villas daily to a very high standard. The pool was beautiful and we made the most of it. Beds were very comfortable; bathrooms very spacious; and airconditioning was fantastic. We loved the short walkways to the main road, where shops and restaurants were plentiful. The villa was also reasonably close to the beach in our opinion. 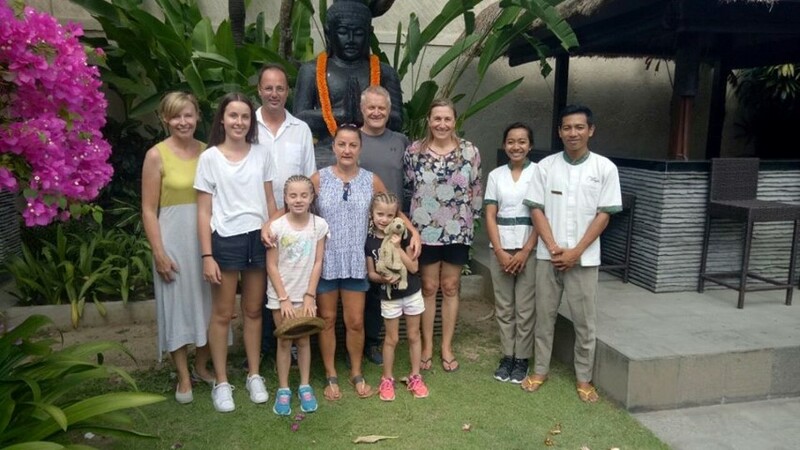 All the staff were very friendly and we will certainly make this our favourite place to stay, when our family returns to Bali. We had an excellent stay st villa Mahkota. 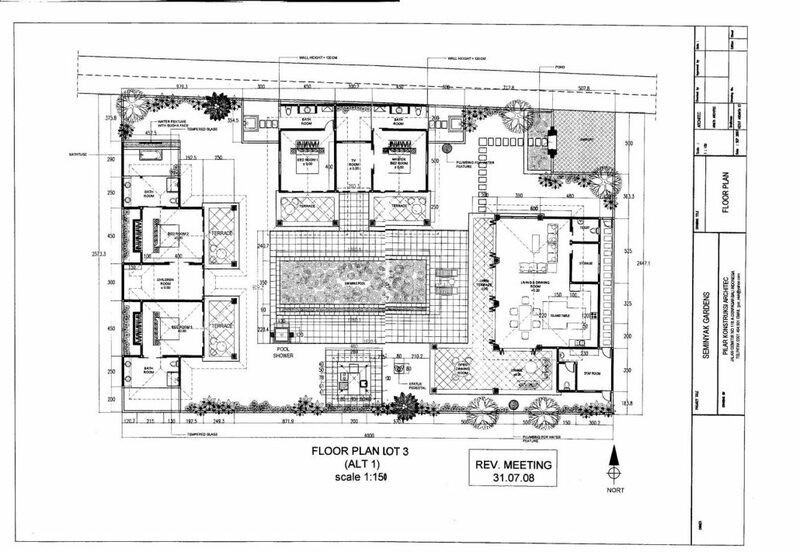 Two families with 5 bedrooms. Facilities and staff were excellent and catered for every need quickly efficiently and courteously. What a great experience. 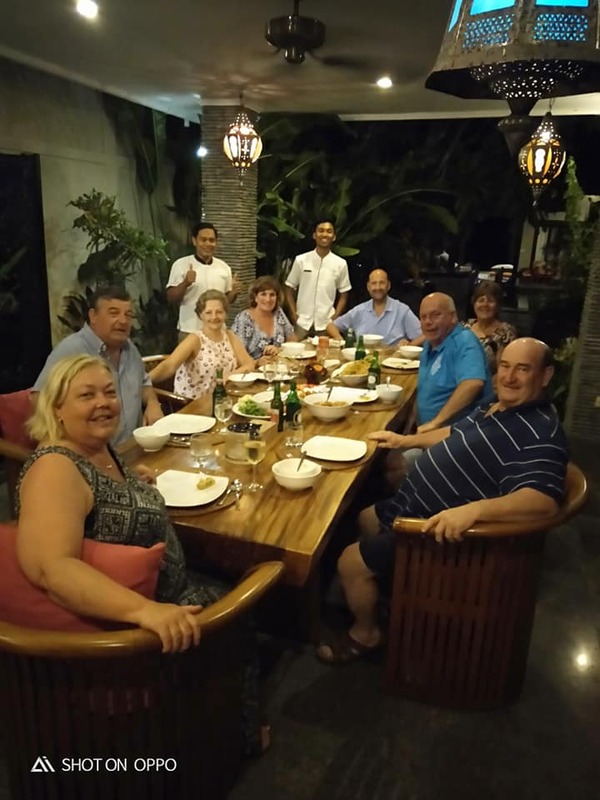 We asked the villa staff to arrange a birthday dinner celebration which they did a fantastic job. 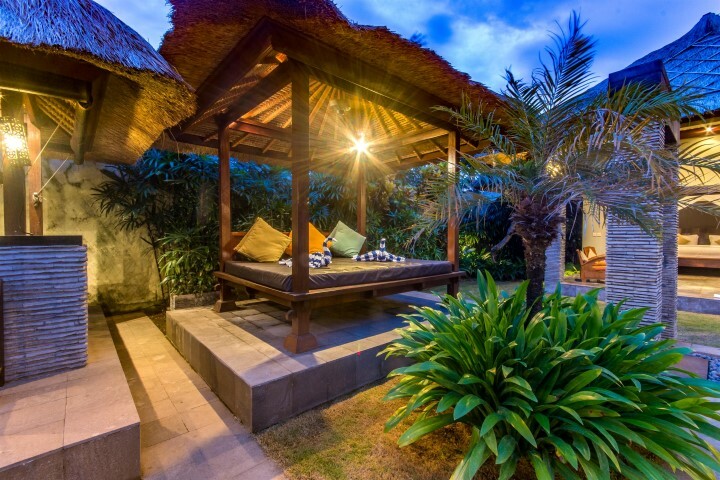 We had an amazing week in Seminyak staying in Villa Makhota. The villa exceeded our expectations and was exceptionally beautiful. A highlight of the trip was the staff and how attentive they were. One phone call and we had assistance within minutes. We cannot fault our stay and are already planning our return. 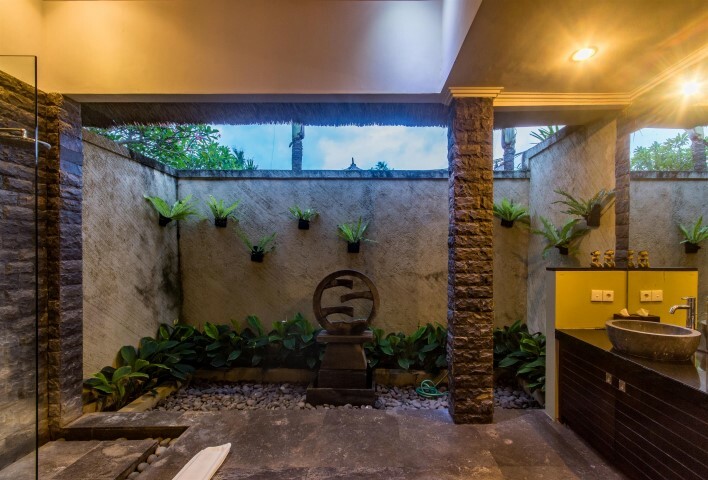 Highly recommend this company to anyone planning a visit to Bali. 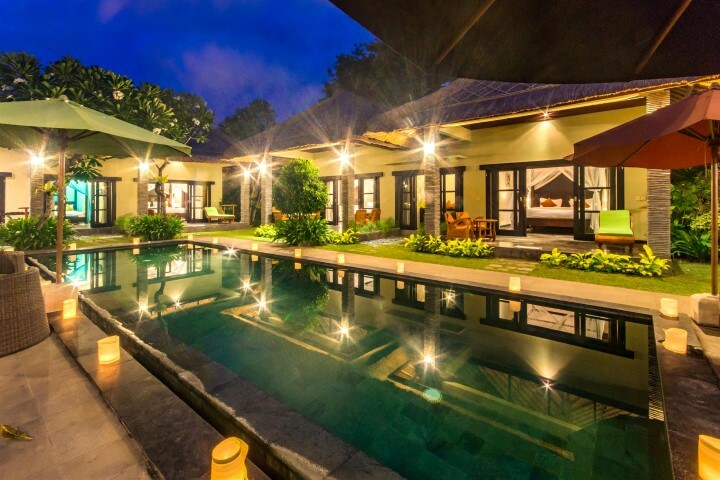 Villa Mahkota is just a few minutes walk from the main shopping and eating area of Seminyak. It’s truly an oasis from the hustle and bustle of the outside world, but very conveniently located. The staff were very helpful and made sure our stay was very comfortable. 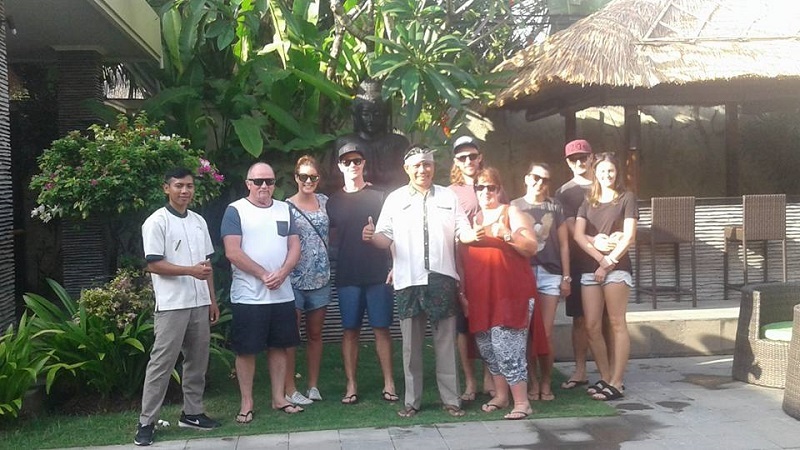 We would love to go back again and spend some more time experiencing the wonders of Bali from this terrific accommodation. 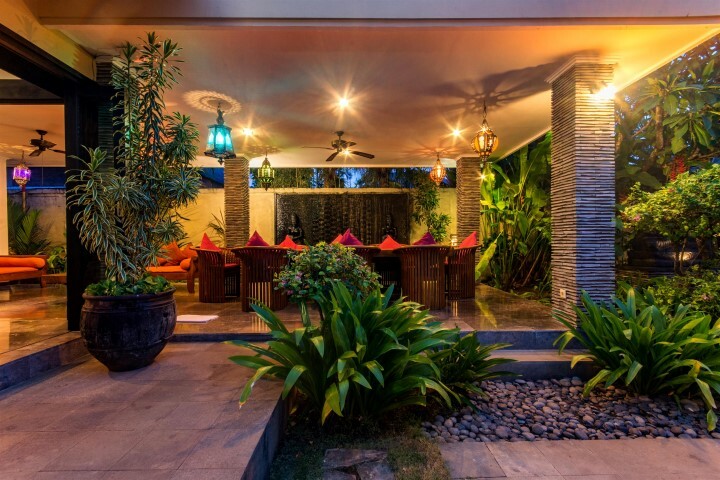 Great location 5min walk to the Bintang supermarket and lots of great shopping & restaurants nearby. The Staff and Management at Villa Mahkota were excellent very friendly nothing was of any trouble for them, we arrived and had thought we would go out for tea the first night but the moment those Balinese doors were opened to our villa’s private yard we knew we had found paradise we really didn’t want to leave, so asked if we could arrange someone to come and cook for us this was no problem at all. The next day reading though the book about what villa has to offer there was a part about in Villa dinning was no troubled just give staff 24 hours notice (we gave them 4) felt so bad so apologised to staff the next day and they were like no worries at all saying it was no trouble for them. Staff arranged a tour for us to the rice fields and temple which was one of many highlights of our trip. Had in villa massage organised for 8 people within 2 hours of request. 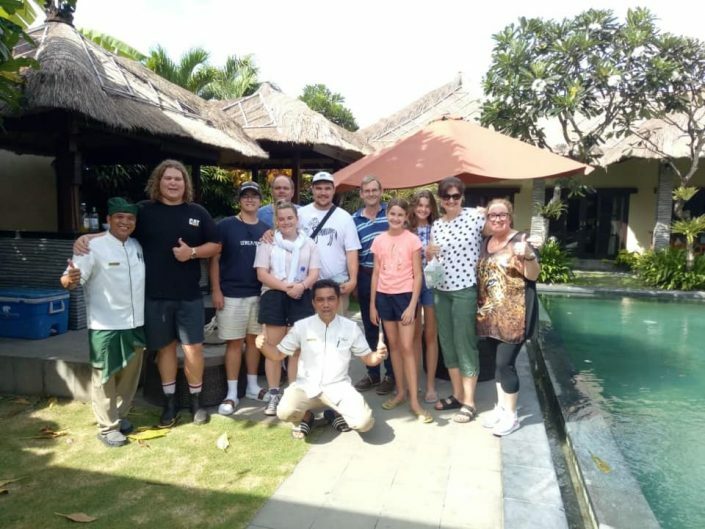 There is so much more I could write about Villa Mahkota and Staff but really all you need to do is book a stay for yourself and you will never want to stay anywhere else. Currently trying to work out when we can book our next trip back. 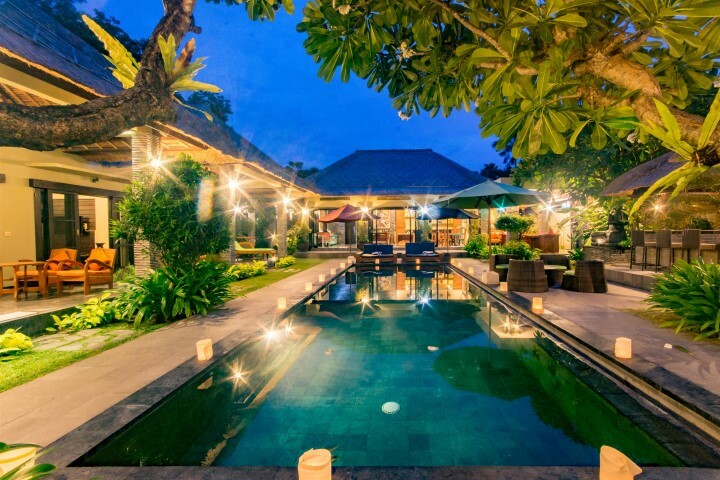 Villa Mahkota will not disappoint. We have visited Bali many times over the previous 10 years and stayed in a variety of accomodation types and styles – this was our first experience staying in a Bugis Villa. Stayed for a week with 4 adults and 4 teenagers – could easily have stayed longer. 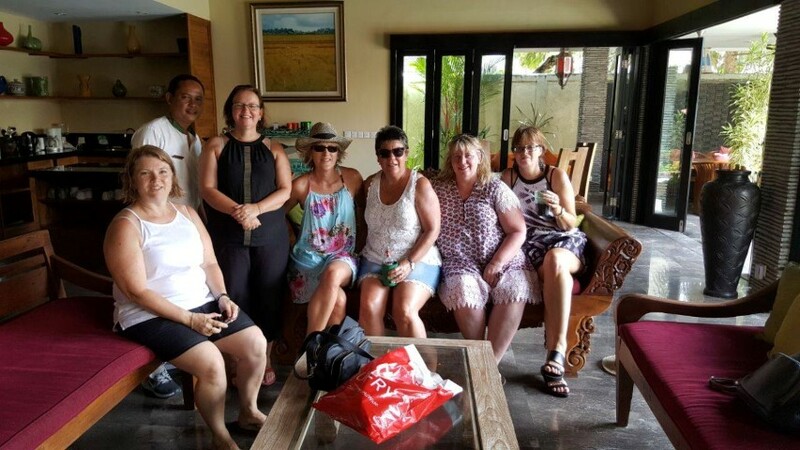 Loved the sense of space that you get from this villa – you can easily all be together or just as easily be in small groups without bothering others – numerous places to lounge around and sit. 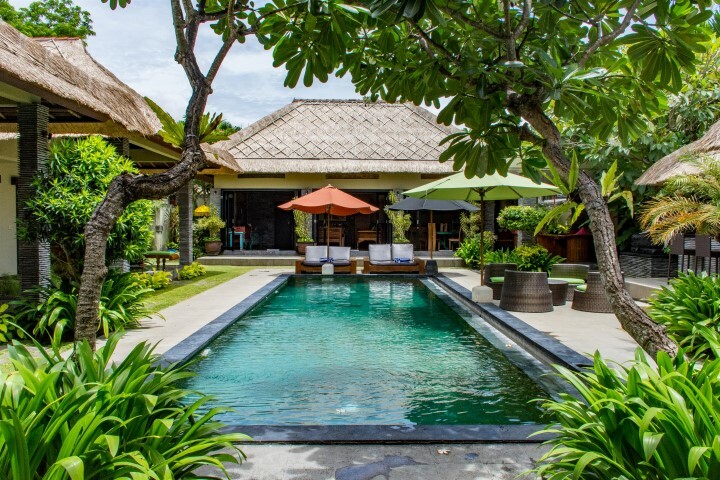 More a traditional style villa than the newer more modern villas – we loved the gardens and “old bali” feeling. 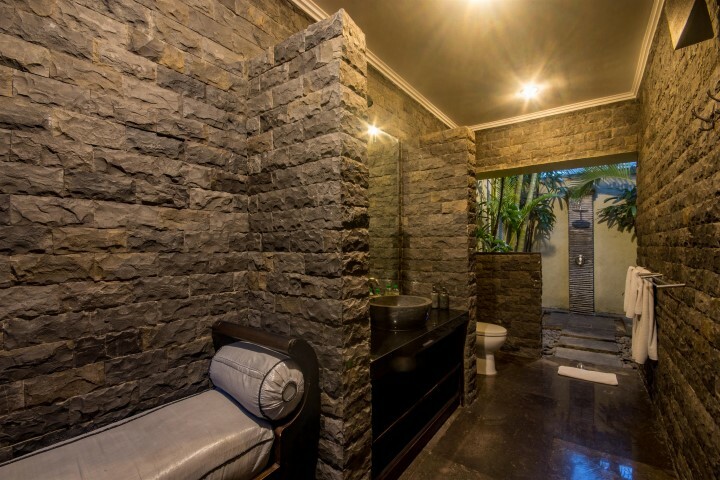 An easy 5 minute walk to Bintang supermarket or 10 minute walk to Jl Camplung Tanduk. Anytime we needed a cab we just walked up to the main road at Bintang – mostly got dropped off there as well on the way home as it was easier than trying to explain to cab driver how to get to villa. 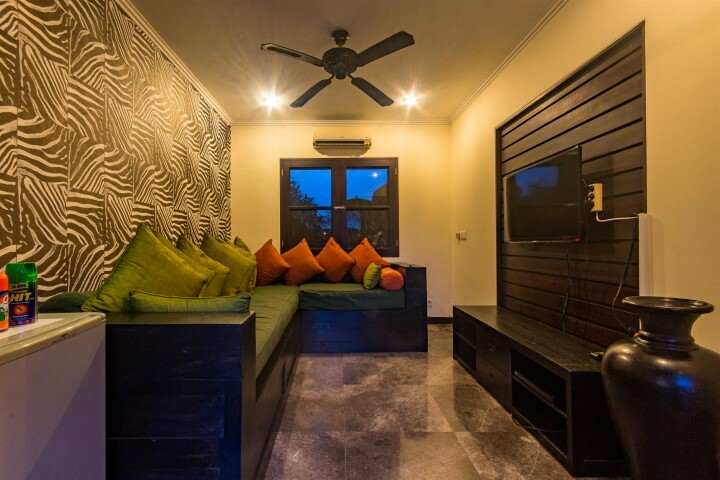 We would definately stay at this particular villa again or any of the other Bugis Villas if this experience is anything to go by. The villa was very spacious with private pool to ourselves. Service was excellent and Kadek had been of very great help through out the stay. Ideal for big group and comfortable to stay. 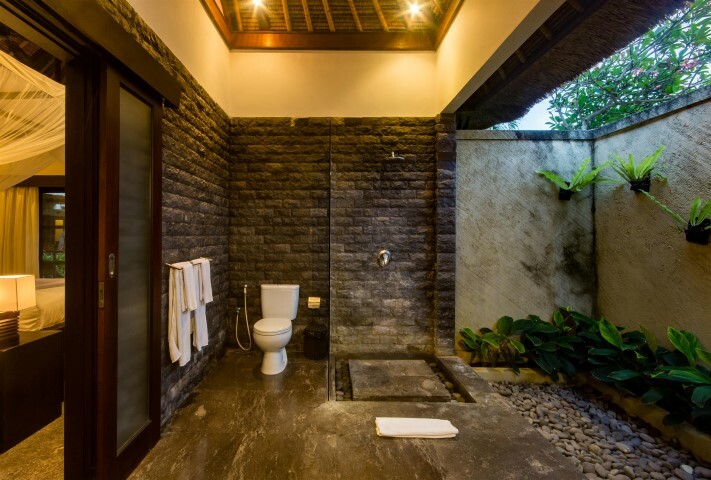 However, we do find the location of villa to be quite secluded and taxi could not find its way into the villa. Special thanks to Anie and Dewi who helped with my bookings of the 2 villas for this visit. Very prompt in clarifying any queries that I had. Overall, a great experience with Villa Bugis. 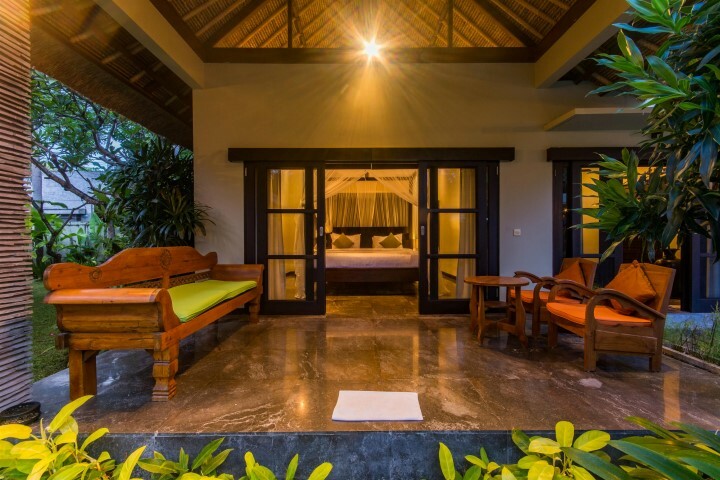 A 7 night stay at this amazing villa, we didn’t want to leave! The villa is enormous with plenty of space – we were a large group of 13 and didn’t feel cramped at all. The location was fantastic, a 5 min stroll to the Bintang Supermarket, shopping and great restaurants. It’s also the staff that really make this place incredible – nothing was ever too much trouble. The breakfast team came in everyday and cooked up a storm, took care of all the cleaning up and barely made a sound! All the staff were so lovely, always smiling and so friendly! 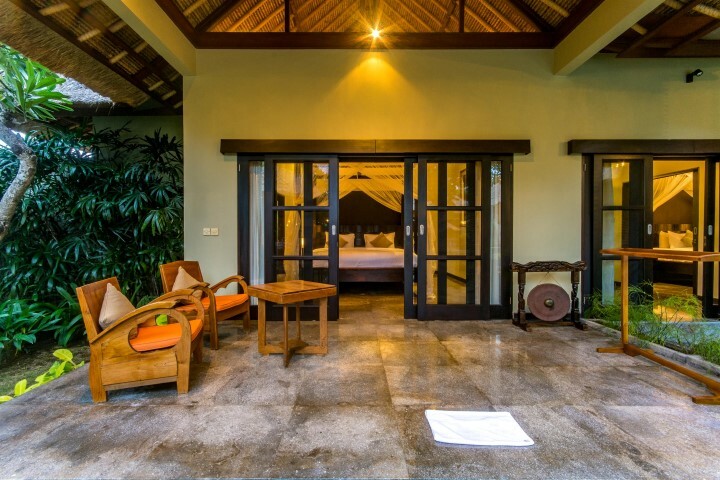 The rooms, pool, gardens and living areas are kept to such a high standard – everything was immaculate. 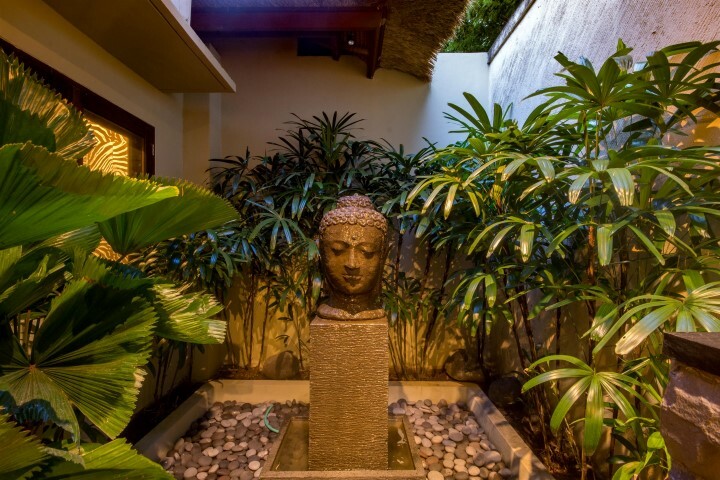 We arranged massages, pedi and mani treatments through our villa manager – he had experienced people there within the hour! 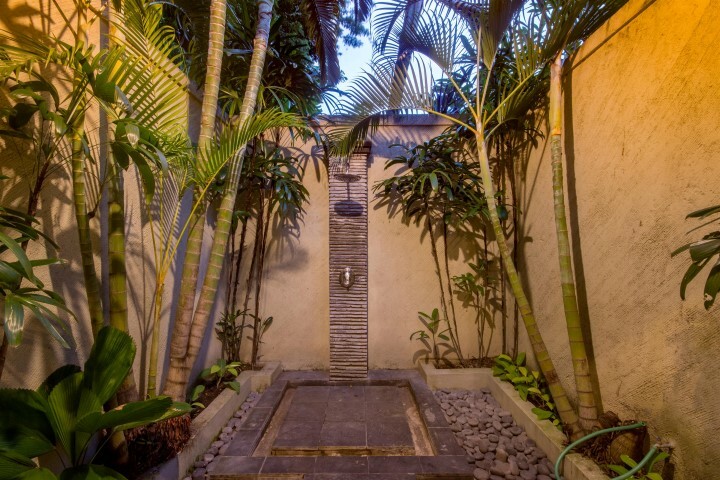 An hour long full body massage without having to leave the villa for $13! Highly recommended! 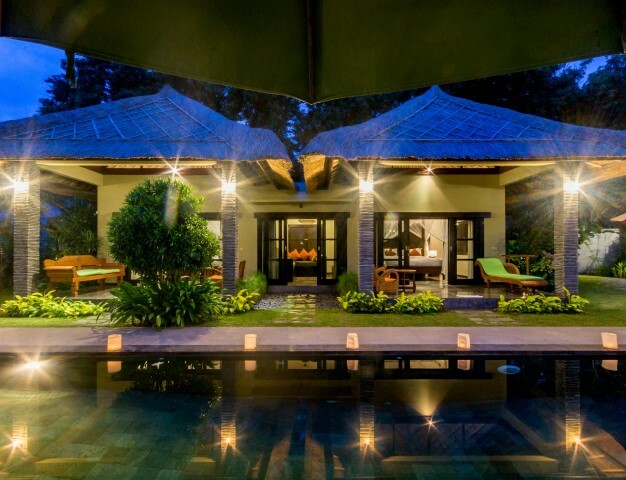 I would recommend this villa to any larger groups of family and friends who love having extra space. 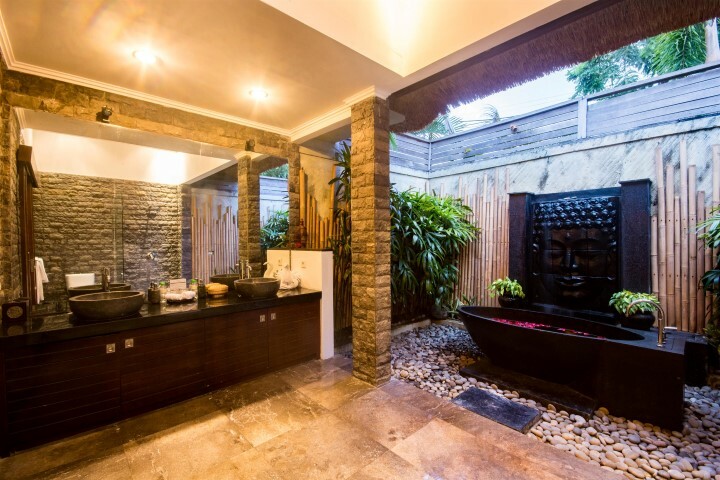 This is our second stay through Villa Bugis and they are a dream to deal with. 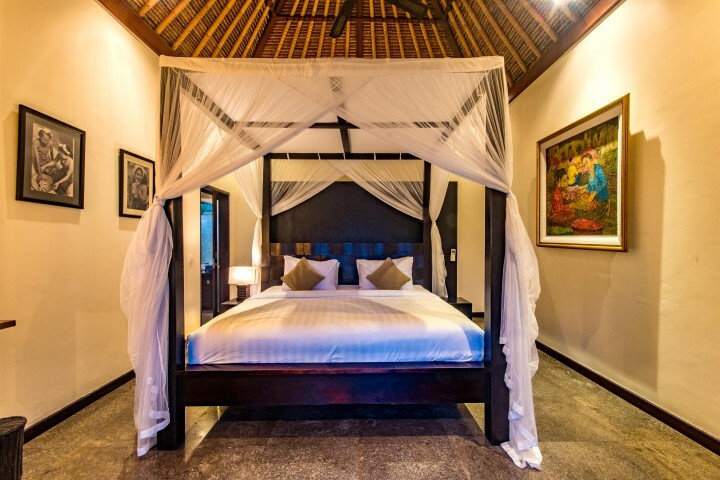 The villa is also excellent value for money, you get so much for your hard earned dollars and total privacy – an average of $80 per person per night – amazing value!! 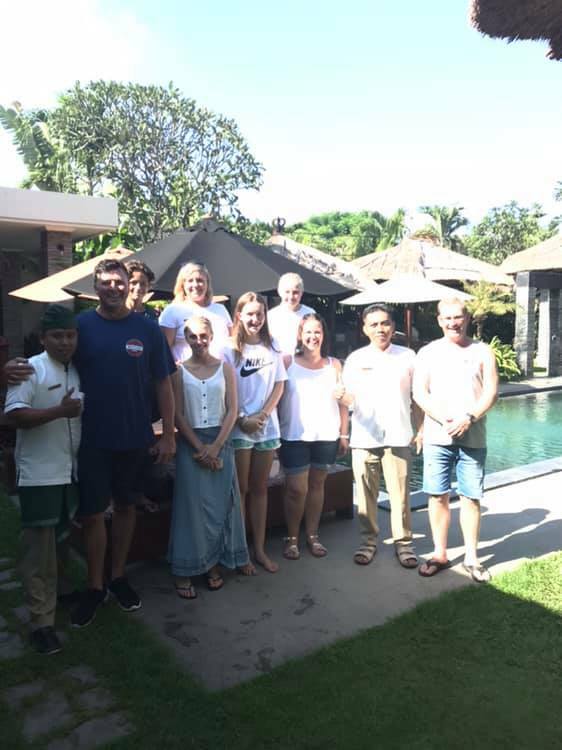 Thankyou Villa Bugis – we will be back in 2016!! A fantastic villa, very large rooms and beds, large grounds with plenty of living spaces and grassed areas. Perfect for a large group of friends or families and children. 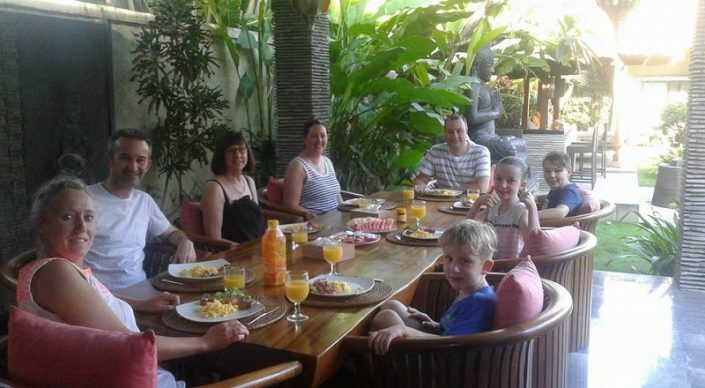 Staff are amazing, rooms and kept clean and the daily breakfast is good. The only negative would be the noise from the lane way as this kept us awake and woke us most nights. 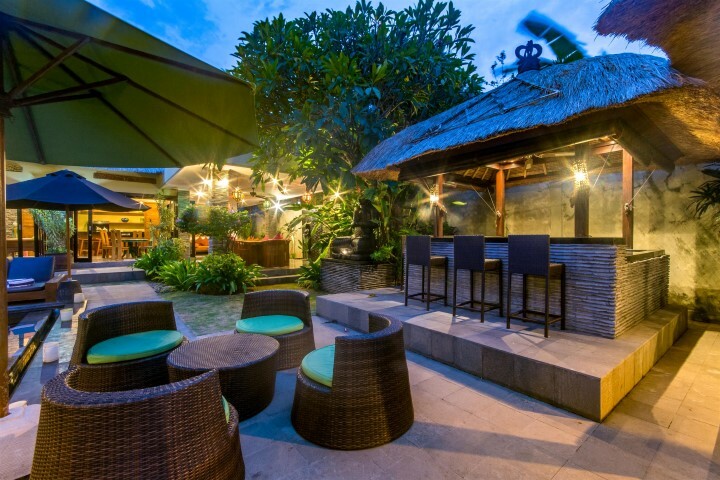 Location is average as its a long walk to the beach but nice and close to Bintang supermarket. Expensive villa but enjoyed our stay. The management staff were fantastic in replying to many emails regarding our stay. They were always happy to meet our requirements. 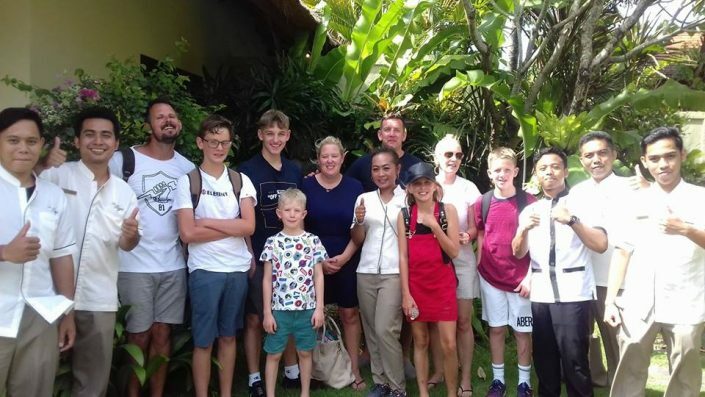 We holidayed in a large group, of 8 adults and 7 young children, and found Villa Mahkota to fullfill a great family holiday. Location was perfect, with a short walk to many restaurants and shops/markets. The housekeeping and grounds staff were extremely friendly and accommodating, and went out of their way to ensure we enjoyed our time there. The BBQ menu options were fantastic and a must if you stay. This was our 4th booking with Villa Bugis and first stay at Villa Mahkota with two families, 4 adults and 4 kids. As Mahkota is a large compound around 1000m2 it enabled us to spread out and have our own space when needed. 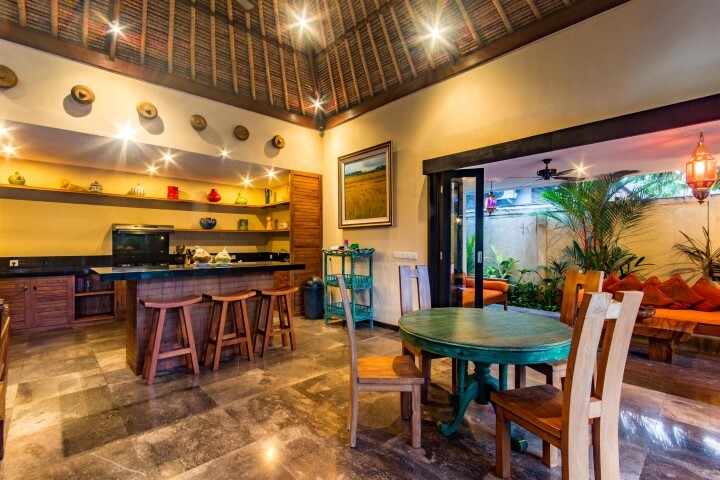 The villa has great areas to eat, drink and rest, all surrounding a large central pool. 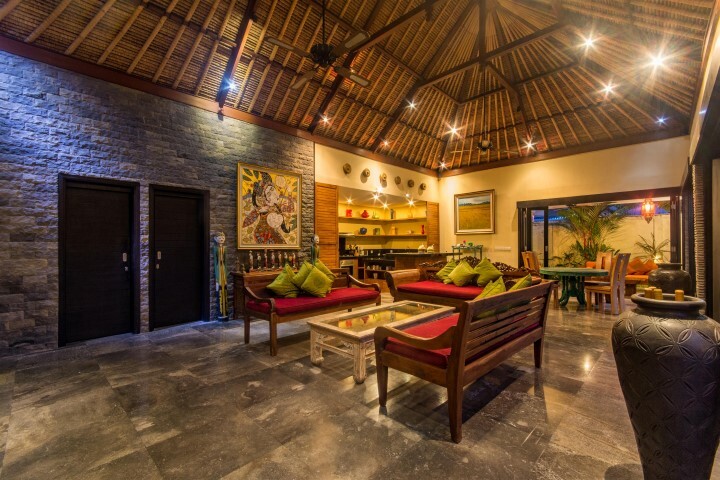 It is a great place to relax and have space but also be in reach of family and friends. 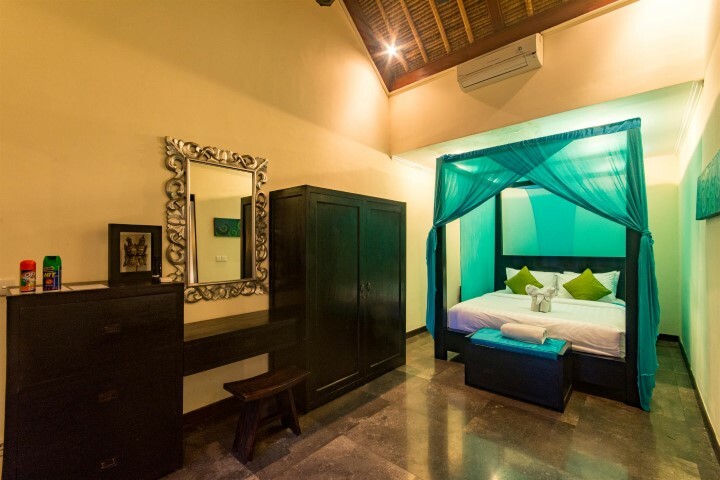 The bedrooms are all generous and as they are individual allows for privacy and peace and quite. The TV room was great for the kids to go and chill out after a big day down the beach. The main living area is terrific, though we found ourselves living outside for most of the stay. The kitchen is handy though needs a bit of a tidy up. Our favorite spaces were the outdoor eating area where meals were prepared for us, the bar (with super cold bar fridge) and pool side lounge areas. 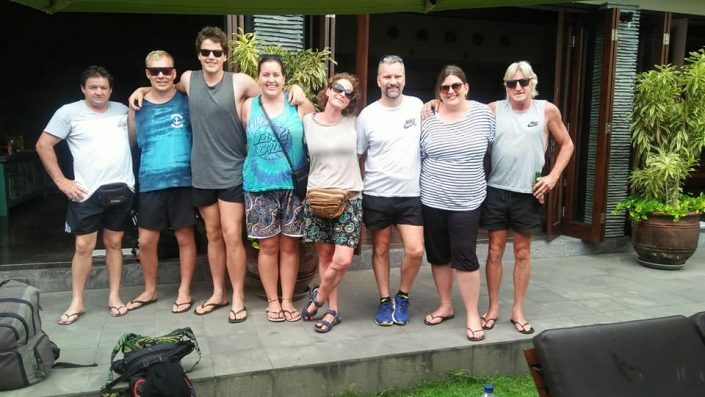 We found one of the best ways to enjoy the villa was to get the boys to race off to one of their favorite Warungs and bring us back a meal of Nasi/Mi Goreng etc. and then get back into the pool. 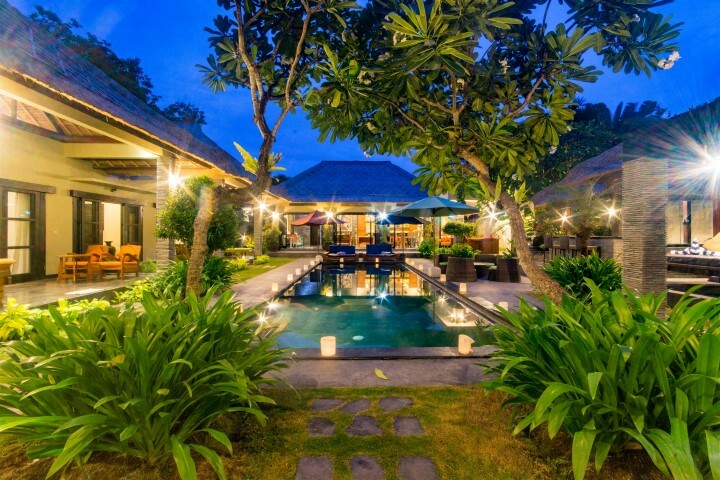 The villa is in a good location and a short walk to the Bintang Market and Jalan Raya Seminyak. We find it best to have scooters on hand in order to get to the beach as it is quite a walk and certainly not direct with the little narrow lane ways. The lanes make it difficult for larger transport vehicles and taxis to navigate, a walk out to Jl. Raya seems to be the way to go. The narrow lanes are not such a bad thing as it reduces traffic and are seemingly quiet. 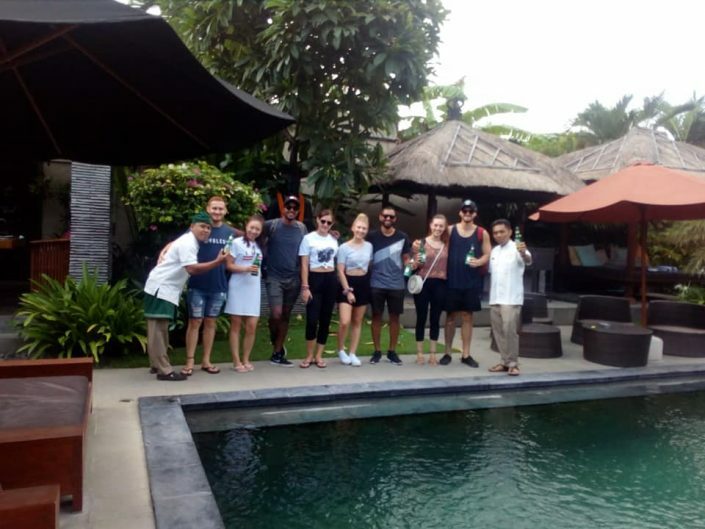 All in all Mahkota is a great villa in a good location, the staff go out of there way to help you and are always smiling and friendly. We had a fantastic stay. Everything was great. The staff were fantastic they couldn’t do enough for you. We hope to come back next year. 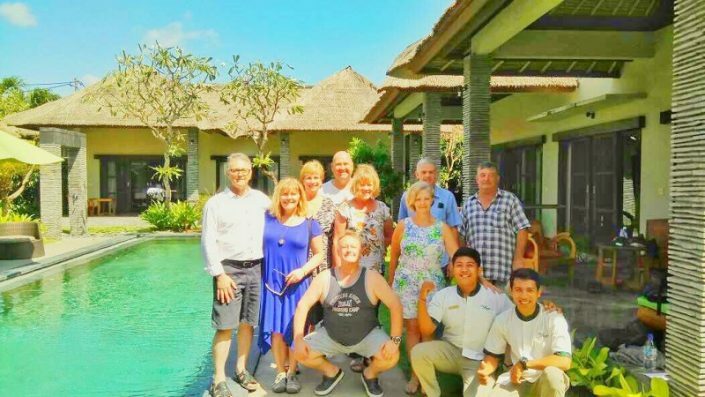 All the staff for Villa Bugis’s properties was really first rate. Kind and helpful and they really want to make sure you have a great stay. 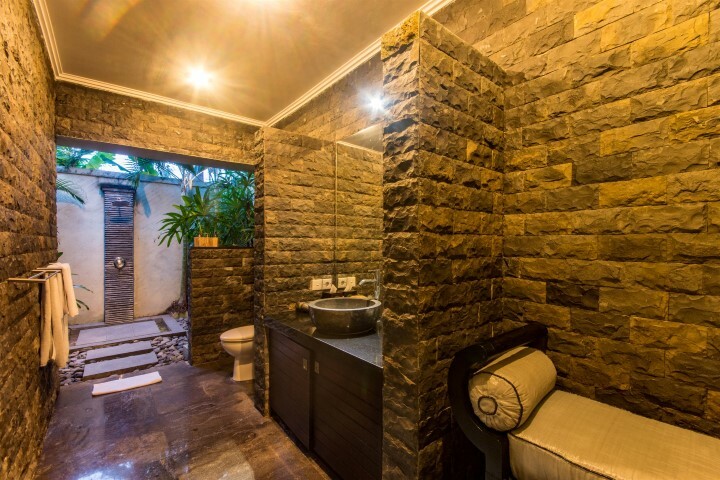 The property pictures and description don’t do it justice, it’s really so beautiful and serene – but less than a 5 minute walk to a major grocery store and all the action on the main street in Seminyak. Our booking came with daily breakfast (delicious) and the villa was cleaned daily – they even arranged for massage and pedicures on site – we felt so pampered. 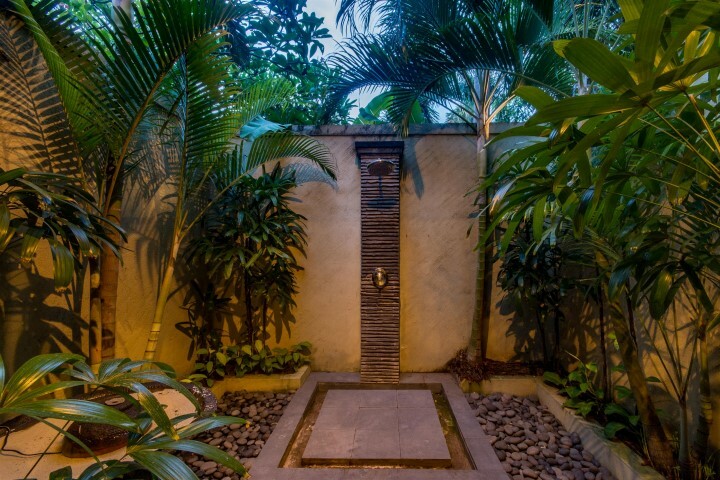 4 Master Suites with air conditioning, a TV room, plenty of outdoor lounge space, the pool was very large and the grounds and sculptures were beautiful. 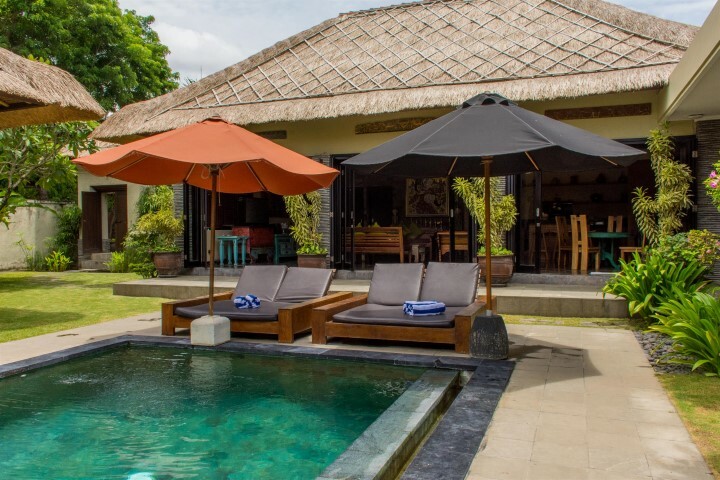 If you’re headed to Bali, with a group or large family, this is an excellent choice. The villa and staff were all absolutely wonderful. 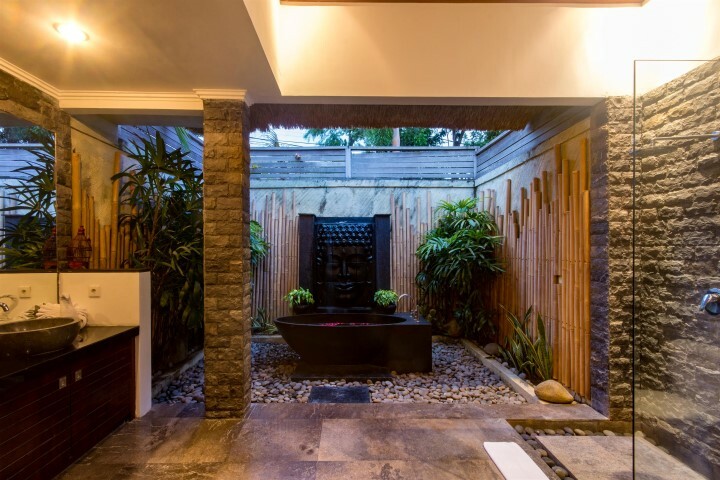 From the extremely serene and peaceful gardens to the massive and beautifully lit pool, the outside king size sunbed to enjoy lovely massages on or a nice afternoon nap. The staff went to all lengths to keep us happy and provided us with anything we required. Breakfast everyday was beautiful and plentiful and we also had the staff cook dinner for us one night. To call it a smorgasbord just wouldn’t do it justice. Nothing I can really fault about the villa at all. 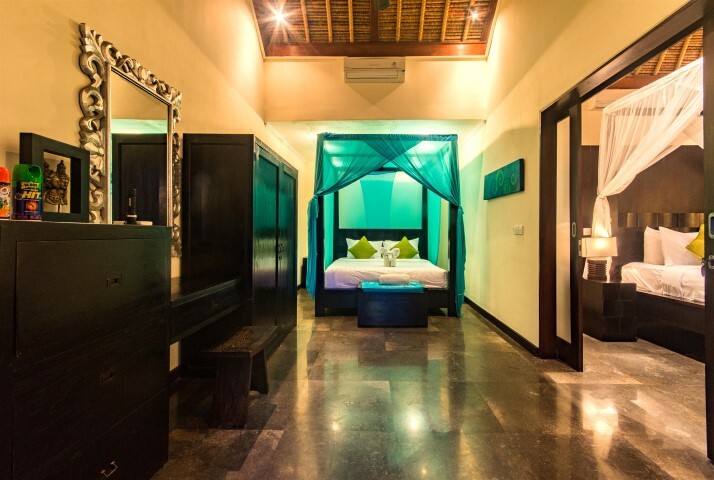 The rooms were all beautiful and wonderfully furnished and overall we had a wonderful holiday staying here. Thank you to all the wonderful staff that made our trip memorable. We stayed in the Villa in mid January and loved it. The staff were very accomodating and nothing was too much trouble. 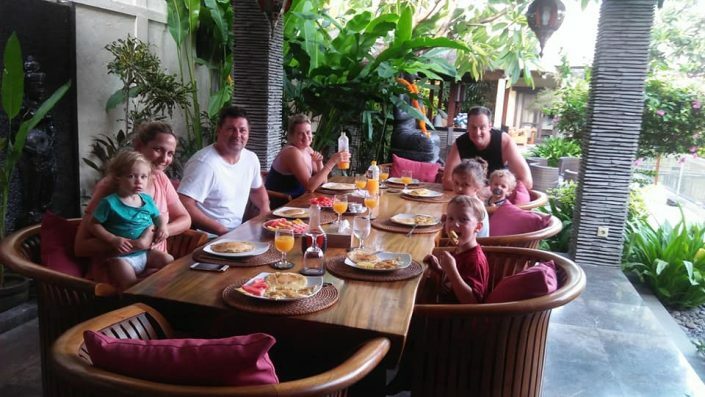 Having our own villas within the complex and sharing a common pool and eating area was great. Being able to swim in the pool late at night was also a bonus. 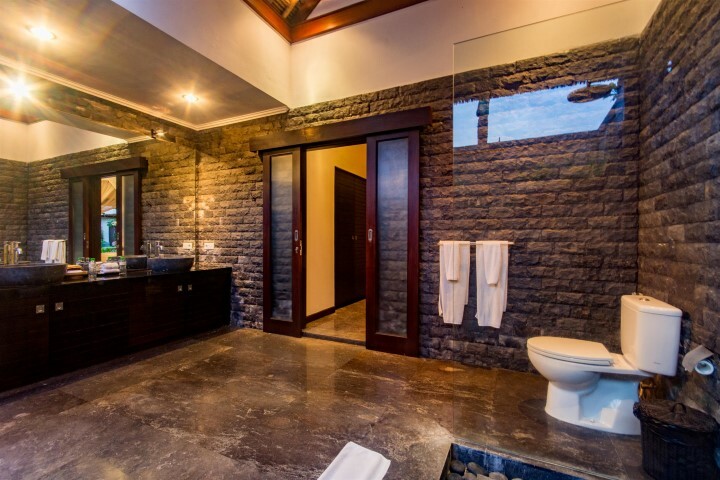 The villas are well equiped and they even supplied the mosiquto spray. The mosquitoes were probably the only downside. Perhaps a regular spray by ground staff would be a good idea. We were very close to restuarants and the shops. 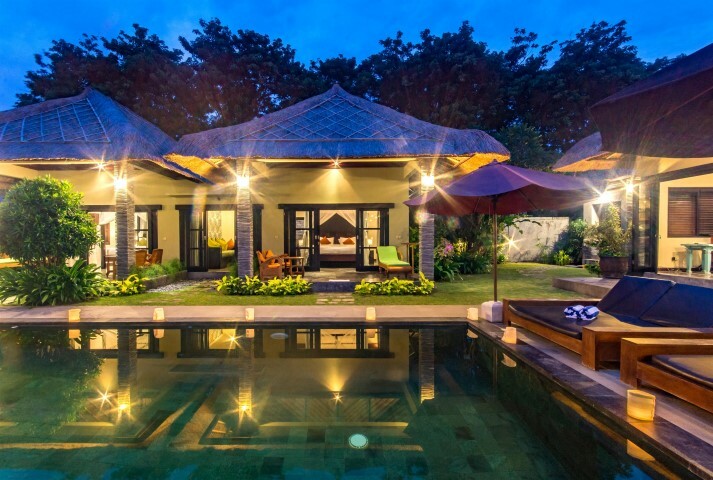 Well worth looking at staying in these villas if you are travelling to Bali. The air conditioners have all been replaced over the last 12 months and the mosquito nets have just been replaced. Kadek and his staff were very accommodating, cooking yummy breakfast and providing great service. 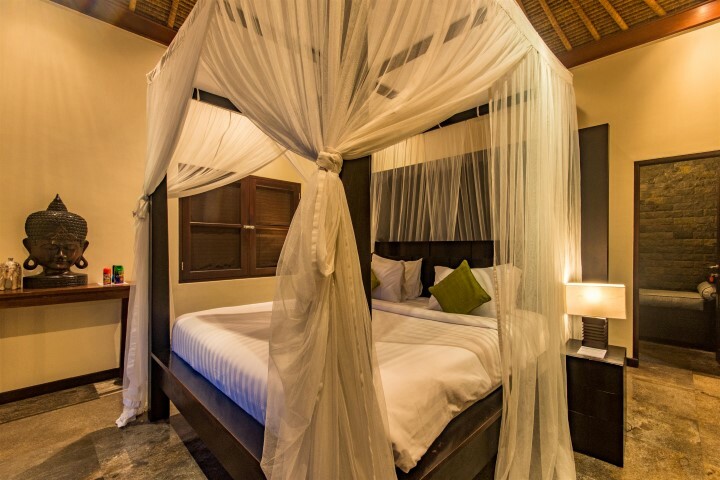 Mahkota villa was generally clean a few of the mosquito nets needed replacing. The water in one bathroom was smelly but thankfully Kadek and his team addressed it straight away. PS. we were disappointed with the pool fence, the cost was way too much, and it wasnt secure enough. The place is beautiful,facilities are satisfactory.. Improvement required for newer appliances suchas A.C. and TV overall experience is great..
We had a great time while staying at our gorgeous villa . Would recommend it to all our friends in australia..all the staff and komang our head man was lovely and very helpful..
nice villa to stay in….. wish it could be a little better. Main room should have air conditioner since it’s very hot nowadays, and some rooms the air condition aren’t very cold. other than that, good villa to stay in.